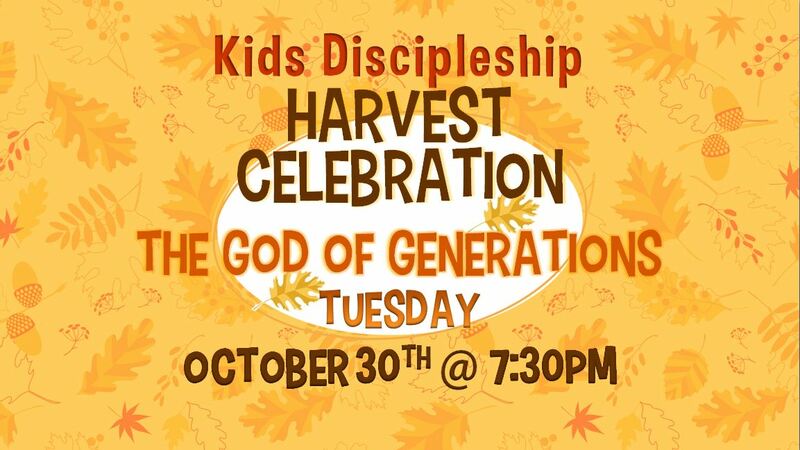 The Kid’s Discipleship Ministry will be celebrating their Harvest Celebration on TUESDAY, OCTOBER 30th at 7:30pm. This year’s theme will be “The God of Generations!” Kids can dress up as a person from a previous generation that has been a positive influence or an inspiration in their life. This can include: grandparents, parents, aunts, uncles, teachers, pastors, a coach, or a leader that has positively impacted a segment of society. We’re looking for Builders, Baby Boomers, Generation X, and Generation Y to be well represented. We’re asking parents to please sign up at the Information Center for home baked goods, fruits, juices, water and snacks.